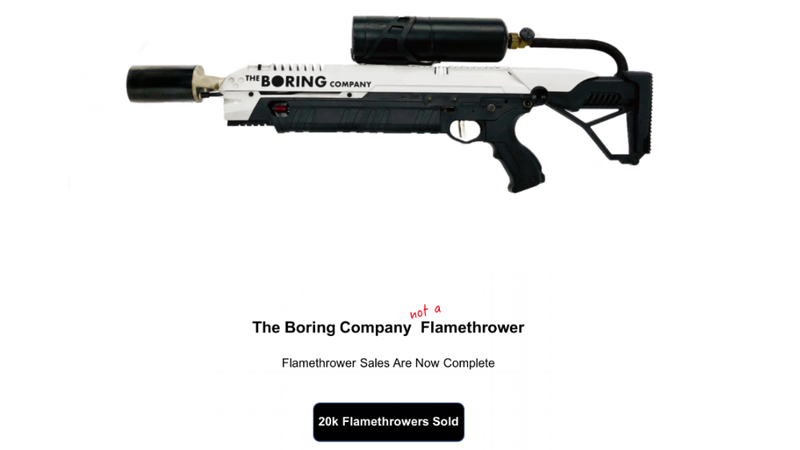 Chipper villain Elon Musk has been having what appears to be a lot of fun selling dubiously safe Boring Company “flamethrowers,” which despite outrage from some politicians are actually just garden-variety torches packaged to look like a weapon from Portal. He’s sold 20,000 of them for $500 a pop, netting a cool $10 million in the process, and all without actually having to show any further progress on the company’s tunnels! Time may be of the essence with these purchases, seeing as many of Musk’s customers appear to be trying to flip them ASAP on eBay, so either this will somehow work or some people are going to get mad at him. In any case, at least the re-branding is accurate, and Musk is getting all the press a giddy billionaire’s heart could ever desire.